The Hot Dog Truck: Vegas Baby! The Hotdogman is back from vacationing in Las Vegas to begin the long haul of slinging hot dogs through Thanksgiving! Despite today's mishap with the electrical system, I will be ready for the long haul of hot doggin'. This was my 19th trip to Las Vegas in as many years. It was the first time I did not stay in a hotel and carouse the entire time. I actually saw the real city for the first time. I talked to real Vegas residents at the playground and ambled around the Vegas burbs and outskirts. I found it to be a clean, live able city. 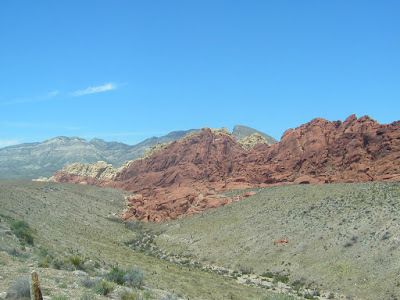 My in laws live 10 minutes from Red Rock Canyon National Park. What a fantastic place! I explored the canyon every day I was there. 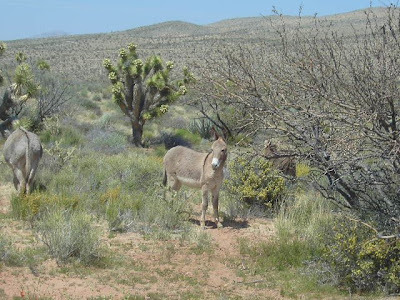 I even saw some of the wild burros that inhabit the area. Very cool! Of course no trip to Vegas is complete without a trip or two to the casino. I had a winning ticket for $450 from the Red Sox World Series victory I needed to cash at the Red Rock casino near the in-laws. Unfortunately, it was 120 days past the event and in that situation you are supposed to mail your ticket in. Harry, one of the managers at the Red Rock Sports Book, took care of me. He dealt with the accounting department and got me my money. It turns out I didn't need the money though. I flew out Thursday with the kids and I had a few unsuccessful nights at the Blackjack tables. When my wife arrived at the house at 9:30 Saturday Night, I cajoled her into going downtown since she'd never seen it. She was less than thrilled with the idea, but came along to appease me. We strolled up and down Fremont Street and saw the laser show. Then we sat down to play a little blackjack at the Las Vegas Club. The Las Vegas club used to be the best place in town to play blackjack. Now, like all the other casinos, they have the very bad rule of the dealer hitting the soft 17. It's a terrible rule for players and the only place I saw "real" blackjack was at the Mirage at a $100 dollar table: THAT's a LOT OF HOT DOGS! Anyway, we quickly lost about $125 playing blackjack, so we decided to go "roll the bones" at the craps table. Smart choice! We started with $60 each and after about an hour, we had won back what we lost at blackjack. Since it was 1:30 AM, I suggested we leave. My wife said, "we can't leave when we're winning!" We didn't. Roll after roll by shooter after shooter was making us cash. When the dust settled, we'd raked in over $800 combined! We left at 4AM with our wallets quite a bit fatter than when we started! And she didn't even want to go out! The next night we saw LOVE, the Cirque de Soleil Beatles tribute. Great show! It ended at midnight and when we got back to the house I suggested we try our luck at the Red Rock Casino. After about an hour of Blackjack, we were even. We went to the craps table and KILLED it AGAIN! 4 AM and another $800 richer we crept home to bed. The next night we spent some of our winnings at Terra Rosa, an fancy schmancy Italian restaurant opened by one of the winners of Hell's Kitchen. I hate to say, but chef Gordon Ramsy would be disappointed. I've had better Veal Parm in local red sauce joints. For the money we spent, I wasn't over joyed. After dinner, you guessed it, CRAPS AGAIN. We only won about $500 that night and we went home at 2AM. I love going to Vegas and coming home a winner. I have never had much luck at the craps tables in the past, but ever since I introduced it to my wife on our honeymoon, she's been hooked! I have NEVER LOST AT CRAPS while playing with her. I guess I've found a new game!